Radioactivity. 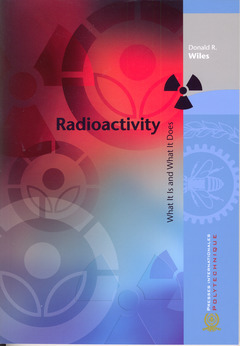 What it is and what is does WILES Donald R.
Auteur : WILES Donald R.
A number of good textbooks on radiochemistry have been published for experts and advanced students, but very few are written for the general public and the nonspecialist. Those that exist are mostly written either by opponents of nuclear power or by those invested in the industry. This book takes no stand on the political controversy surrounding nuclear power, the facts are presented with no sermon attached, and anecdotes from the author's vast experience in the field provide a more personal insight into this complex subject. He gives detailed descriptions of several serious nuclear accidents, including that at Chernobyl. While the author's perspective is primarily Canadian, the descriptions and illustrations are relevant for readers in any country. In the final chapter, the author asks the question, "Are we completely safe?" The answer, intriguingly, is "I hope not." Read on to see why. Chapter 1. Radioactivity: What It Is. The Nucleus. Some Unstable Nuclei. What Is Radiation Like? How Is Radiation Damaging? Measurement of Radiation. The Biological Action of Radiation. Chapter 2. Industrial and Scientific Applications of Radiation. Industrial Uses of Radiation. Scientific Uses of Radiation and Radionuclides. Atomic Movement in Solids. Radioactive Dating. Chapter 3. Medical and Health Applications of Radiation. Medical Uses. Scanning. Radiation Treatment of Tumours. Notes on Other Health Applications. Sterilization of Medical Supplies. Irradiation of Food, Pests and Cosmetics. Chapter 4. Nuclear Fission and Nuclear Reactor. Nuclear Fission. What Is Nuclear Power? Reactors of the World. Experimental Reactors. What Can Go Wrong in a Nuclear Reactor? Chapter 5. Radioactivity in the Environment. Natural Background Radiation. Man-Made Radionuclides. The Environmental Migration of Radionuclides. What Can We Do About It? Chapter 6. Who Is Watching? What Are the Limits? Who Is in Charge? Atmospheric Monitoring. Chapter 7. Major Nuclear Accidents. The Anatomy of an Accident. Accidents That Have Happened. What We Have Learned. Chapter 8. Nuclear Waste Disposal. What Is Nuclear Waste, and Where Is It Kept? What Can We Do for the Future? Nuclear Fuel Waste Disposal in Other Countries. Additional Forms of Nuclear Waste. Chapter 9. Are We Completely Safe Now? Potential Dangers. A Final Thought. Appendix I. Some Radionuclides Used in Medicine and Industry. Appendix II. Some Useful Mathematical Derivations. Appendix III. Bibliography and References. Appendix IV. Glossary. Index.